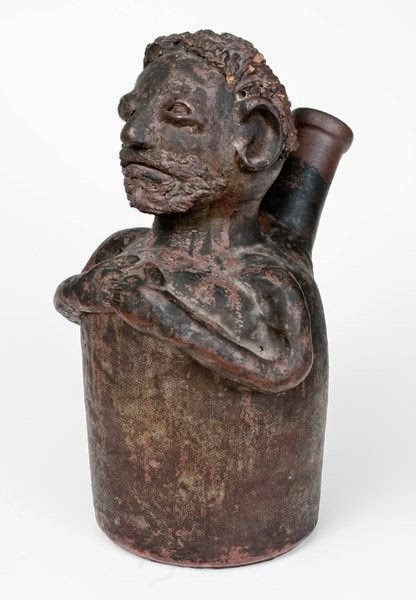 Outstanding Large-Sized Southern Stoneware Face Harvest Jug, possibly Alabama, fourth quarter 19th century, wheel-thrown face vessel in the form of a bearded man's torso with hands folded across his chest and large applied pouring spout on reverse. Face includes large, applied C-scroll ears, bulding eyes, nose, and well-detailed hair. Surface covered in a reddish-brown Albany slip glaze with large traces of later black overpaint. While the artist of this impressive example is unknown, he was clearly familiar with and adept at face vessel production. 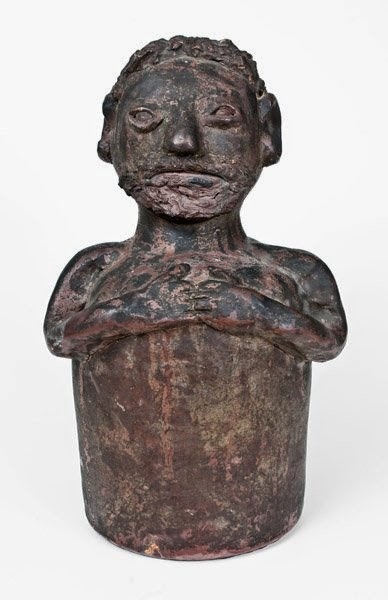 The skillful modeling of the face indicate a maker whose abilities rivaled many of the face vessel producers in the American South during the second half of the 19th century. 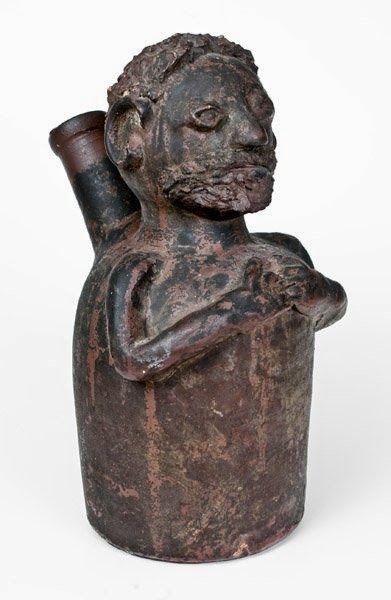 The size and form, including the distinctive clasped hands, suggest this example may have been produced in Alabama in the Rock Mills potting style. That being said, the application of the face reveals a more refined hand than most or all Rock Mills school face vessels known. Excellent overall condition with small chips to hair, one chip to ear, and two very minor nicks to spout. H 14 1/2". Sold for $14,500.00 (w/o premium) at Crocker Farm.